With the arrival of school buses, the crowd grew from hundreds to thousands in a matter of seconds. Unions joined forces in a massive rally descending on the capital Thursday. “This is a government that has brought everybody together because of what they’re doing,” Public Service Alliance of Canada national president Robyn Benson said outside of the War Museum, pointing out employees there are members. An estimated 2,000 people were marching. The joint initiative, led by the Peoples’ Social Forum, had groups heading to Parliament Hill from three locations. Kicking off a four-day social activism conference, tying into Sunday’s Pride Parade, the Unity March was sending a message. “Together, we are strong,” said an organizer, Nicole Maylor. The conference, Maylor said, has 17 intersecting themes, including government and democracy, climate, and food. Participants ranged from scientists to students to retirees. Ontario Federation of Labour president Sid Ryan rallied the War Museum crowd, “to unite the movement and get rid of (Prime Minister Stephen) Harper, once and for all,” he said to cheers. Council of Canadians national chairperson Maude Barlow echoed that sentiment. “Stephen Harper will one day be gone and when he goes, he’s not taking us with him,” said Barlow. 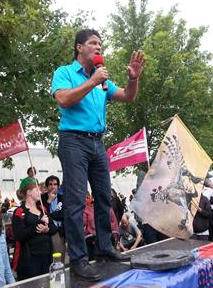 With CUPE and OPSEU flags waving nearby, the heavy union presence was punctuated when Unifor national president Jerry Dias said Harper, former Ontario PC leader Tim Hudak, and Toronto Mayor Rob Ford were going down. Their movement’s biggest victory: Hudak getting “absolutely massacred” in the provincial election two months ago, said Dias. “Think about what happens when we fight, brothers and sisters,” said Dias. One group started at Jacques-Cartier Park in Gatineau — another from Victoria Island — using the Portage Bridge to meet the War Museum contingent then head to the Hill, taking up six lanes wide on Wellington St.
Police — Ottawa, RCMP, and Gatineau — too were united in maintaining peace and clearing downtown traffic with rolling rush hour road closures. A group of about 20 people flew in from Nunavut and wanted to represent their concerns. “We actually see climate change on a real basis,” said Doug Workman from the Nunavut Employee Union. Union of Environment Workers national president Todd Panas said Canada has one of the leading public services in the world. “We want to show the public that we need their support to basically challenge this government to stop the cuts, because we’re all affected by these cuts,” said Panas.